Born into a destitute family, William Edgar Simonds originally set his sights on a career as a school teacher. Service to his country during the Civil War, however, changed all of that and launched Simonds into a life of politics where he earned international acclaim for his service. William Simonds was born in the Collinsville section of Canton on November 24, 1842. When William was just 3 years old his father passed away suddenly and left the family in dire financial circumstances. Still, Simonds managed to attend Canton public schools, graduate from Collinsville High School, and then earn a degree from Connecticut State Normal School (known later as Central Connecticut State University) in 1860. Shortly after, he began his career as a teacher. With the outbreak of the Civil War, however, Simonds enlisted as a private in the Twenty-fifth Regiment of the Connecticut Volunteer Infantry. After receiving a promotion to sergeant major, and then second lieutenant, Simonds fought with the 25th at the Battle of Irish Bend in Louisiana on April 24, 1863. Despite this being the first exposure to live action for many of the volunteers, Simonds and his men held their ground under heavy fire, eventually advancing and driving the Confederate army from the field. Simonds earned the Congressional Medal of Honor for his heroism on that day. Simonds received his discharge from the army in August of 1863 and enrolled at Yale Law School. He obtained his degree two years later, and after passing the bar, he opened a practice in Hartford. He soon developed a keen interest in patent and trademark law. 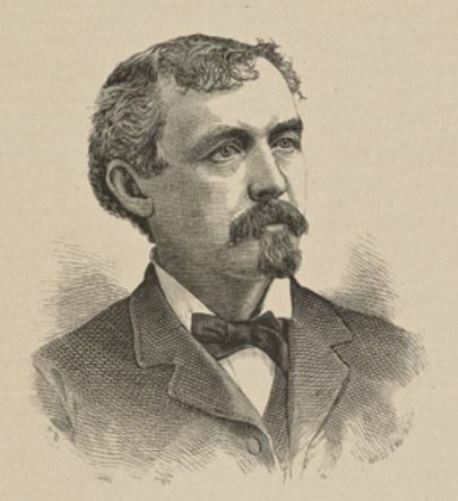 The next phase of his career began when Simonds won election to the Connecticut General Assembly in 1882. He served as chairman of the railroads committee and, later, as Speaker of the House. An election to the US House of Representatives in 1888 placed Simonds on the national stage. Though he failed to win reelection in 1890, President Benjamin Harrison appointed him US Commissioner of Patents. During this time he received the chevalier of the Legion of Honor from France for his work in patent law and spoke at the commencement of the Storrs Agricultural School (later renamed the University of Connecticut) for the work he did to save the school during a state review in the 1880s. After his federal service, Simonds returned to his private law practice in 1893. He died in Hartford 10 years later and received a burial in Canton Center Cemetery in the town of his birth. “Simonds, William Edgar - Biographical Information.” Biographical Directory of the United States Congress, 2014. Link. “Canton Historical Museum,” 2010. Link. Simonds, William Edgar. Manual of Patent Law with an Appendix Upon the Sale of Patents. Hartford, CT: Published by The Author, 1874. Link. Simonds, William Edgar. 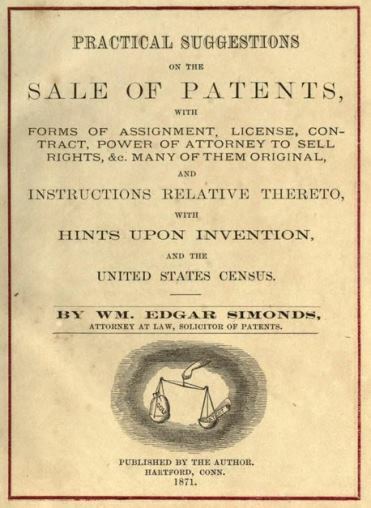 Practical Suggestions on the Sale of Patents with Forms of Assignment, License, Contract, Power of Attorney to Sell Rights, &c., Many of Them Original, and Instructions Relative Thereto, with Hints Upon Invention and the United States Census. Hartford, CT: The Author, 1871. Link.